The process of devolving social security powers to Scotland includes control over employment programmes and Discretionary Housing Payments. 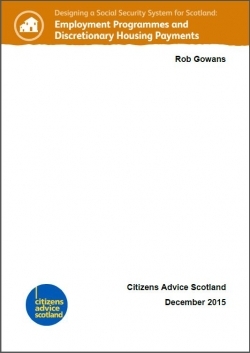 This report sets out a summary of CAB evidence in these areas, and makes recommendations for how the Scottish Government should use the powers when they are devolved. CAS believes that the devolution of employment programmes represents an opportunity to replace the existing Work Programme and Work Choice with schemes that more effectively support long-term unemployed people to get into work, based on the positive employability programmes already existing in Scotland. However, we are concerned that as conditionality and sanctions remain reserved, maintaining a requirement for the new programme to refer people for possible sanctions regardless of any good reason a claimant might have, could result in a tension between the reserved agency providing the benefit and the devolved agency providing employment support, which may undermine good work carried out. The devolution of the Discretionary Housing Payments (DHP) system gives the opportunity to revise existing UK Government guidance and develop some new criteria for its award. However, it is likely that DHPs will continue to be needed to support existing groups of people who currently are priorities for support from the fund. DHPs will continue to be required to mitigate the effects of the underoccupancy charge until Housing Benefit is fully replaced by Universal Credit. There is also likely to be increased demand from people who are subject to the Benefit Cap, due to the UK Government’s decision to substantially lower it, meaning some households Housing Benefit entitlement for some households will be reduced by as much as £6,000 per year.